I have been experimenting further with this idea. 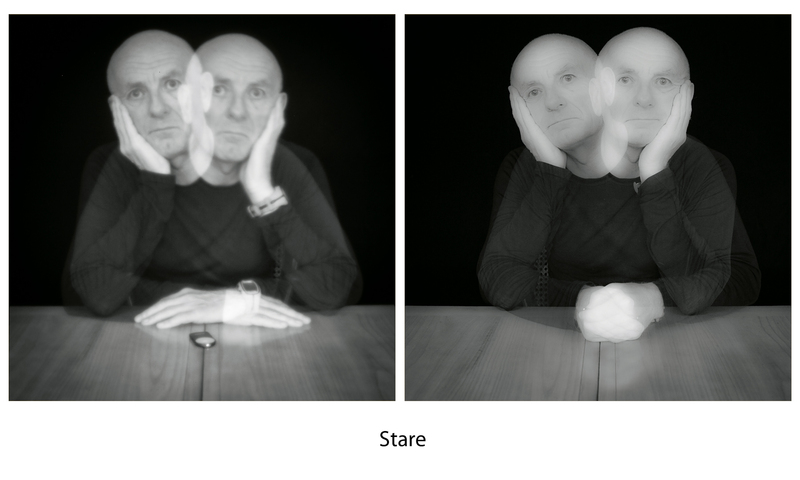 I have been examining the effect that long exposures have by making a series of self portraits. These portraits show a range of expressions which I have called stare, reflect, smile and read. For each, I kept the framing the same and midway through each long exposure portrait I changed my position, whilst maintaining the same gaze. The idea behind this was to capture two portraits overlaid in order to see if my expression remained the same. In other words whether long exposures would result in broadly the same expression on different occasions. 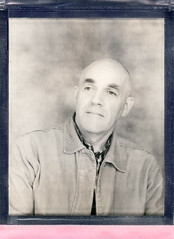 For each of the portraits the exposure lasted for 40 seconds in total (20 seconds for each position). The long exposures were made with a pinhole lens f/140. In order to compare these portraits with similar ones made with ‘normal’ short duration I repeated the exercise. This time I made two portraits for each expression, one a few seconds after the other, relaxing my face in between. I then superimposed the pairs to create images similar to the first set. I also blurred the ‘normal’ duration images a little so that they were more like the long exposures in terms of sharpness, contrast etc. 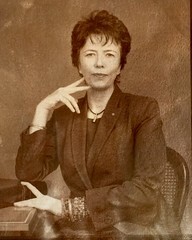 When I look at these portraits it seems to me that my expressions do not change much within each double portrait. 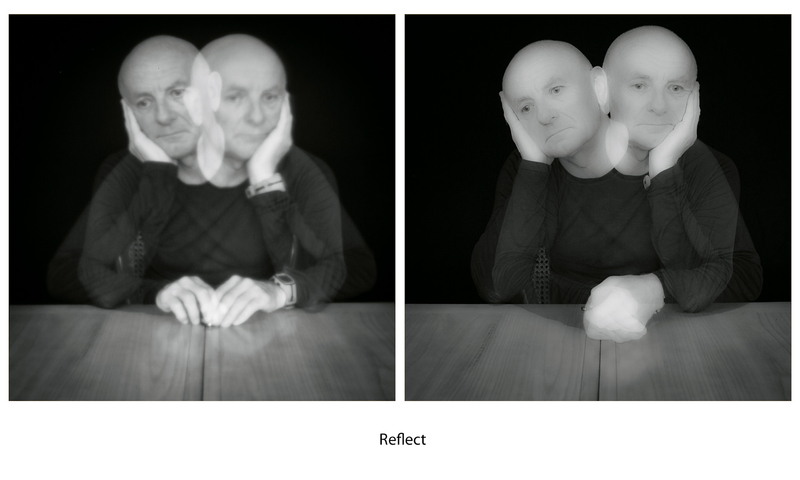 However, in the long exposure ‘reflect’ and ‘stare’ portraits I seem somewhat sorrowful. In the ‘smile’ portrait with long exposure my expression looks forced. In the ‘read’ portrait where I am engaged with something I can focus on and I am not addressing the camera my expression seems similar throughout. I need to look at these again in a few days to see if I have the same impression. The following pairs of images show how the two sets compare. 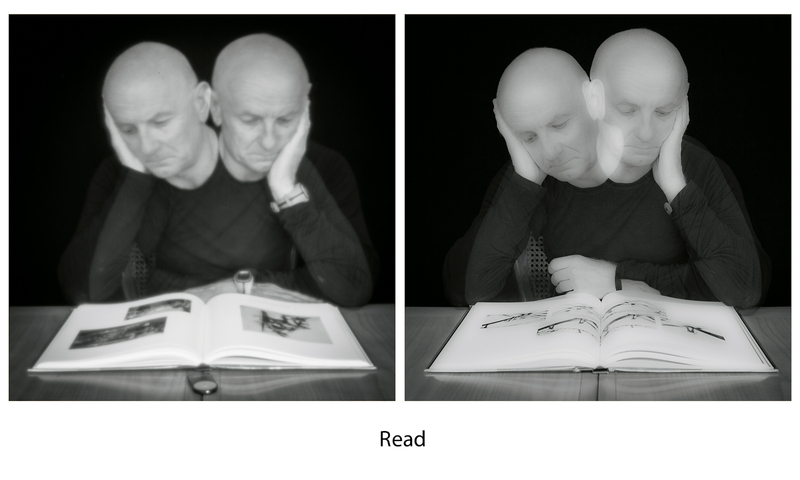 The image on the left in each case is the long exposure. Interesting project! Tuning in more and more into what you are doing after your Dijkstra post. Because it is now starting to make sense. Really prefer the long-exposures to the composited normal exposures. Not sure if it is the post in the composites—but for me they are too blurry. It;s quite difficult to see the detail in the expression that I can see in the long exposures [even if those are not ‘sharp’]. 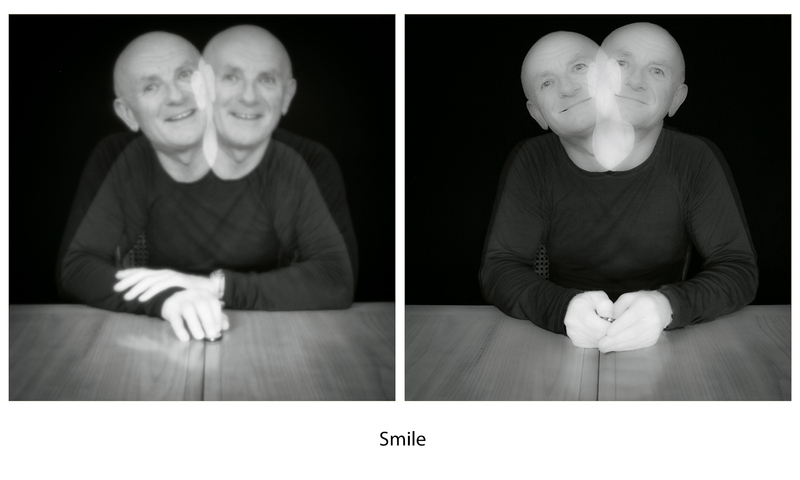 Position of the hands in both ‘smile’ and ‘reflect’ seem really interesting to me. Especially in the ‘smile’ where you ‘2’ really seem connected? Reflect for me seems the most sorrowful—maybe because the eye contact is less and you seem more drawn within yourself. Long exposure smile does not seem forced to me. When I scrolled down, it was the face that I reacted to most—and I smiled back. Would like to see the unfocused composites to really compare expressions. Maybe your reaction to them is that you see more detail than we are seeing because you have seen the unblurred? Fascinating – these are so strange. The smiling ones in particular also struck me first. I do think they look a little forced – the expressions remind me of some of Martin Parr’s work, where he went to foreign photo studios on his travels and had his picture taken there, in the vernacular style as it were. Funnily I was expecting to like the soft ones more but am inclined to prefer the sharper pictures on the right, at least on first looking. That may change as I look again over the next few days. For me I think Reflect and Smile work best, for a range of reasons. In Stare I think you are looking at the camera but it doesn’t feel as if you are to me. It looks as if you are looking just past it. I was expecting to get a really focussed quality of attention from these pictures but instead what I see is a more elusive sense of something slipping just past me. Curiously (to me at least) I don’t get that sense that you are really there looking back as I might in a more candid picture. I wonder if that will change when you start taking pictures of other people and they then have you to react to?